Before we wander off away from the Bootham area, where we’ve spent the the last few pages, I must mention this detail I noticed on the corner of Bootham and Marygate. A new sign marking the ‘HAMLET of st MARYGATE’. Which is interesting in itself. Well, it is if you find local details like signage interesting. And though an interest in such things used to lead to you being told to ‘get a life’, it’s quite trendy now to care about these things. So presumably I can share without shame this photo I took in 2006 of the earlier sign, which said something slightly different. It was very faded, but it’s just about clear on this digitally enhanced image that the old sign read ‘HAMLET OF ST MARY’S’. It seemed rather quaint and charming. So when I saw the new one I assumed they’d made a mistake. I got really irritated and thought ‘more money wasted’ and rolled my eyes and did that cursing the council thing. Later I Googled ‘Hamlet of St Mary’s’, assuming I’d turn up various old documents containing this phrase. But I didn’t. 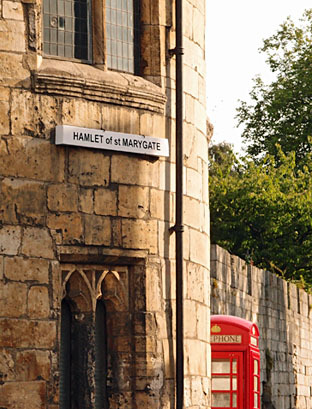 I did though find several references to ‘Hamlet of St Marygate’. Which suggests that the new sign is more historically accurate than the previous one. The old sign had acquired an air of historical accuracy mainly perhaps because it looked old and carefully crafted. Like those 1970s cobbles in King’s Square. I don’t have the time to investigate this mystery of the misnamed hamlet. If anyone has any background information please do add a comment. It will take me a while to adjust to liking the brightness of the new sign, which is now the most prominent thing if you’re looking across from Bootham, so your eyes aren’t drawn so much to the whole picture, the street behind, the verge and the phone box. On that subject, before we head off from the hamlet, another photo from the York Civic Trust annual report of 1946-7, showing the view of this corner from a different angle, a little way down Marygate. A bit tidier than it was. The wall and tower still look a bit ‘ragged’, of course. 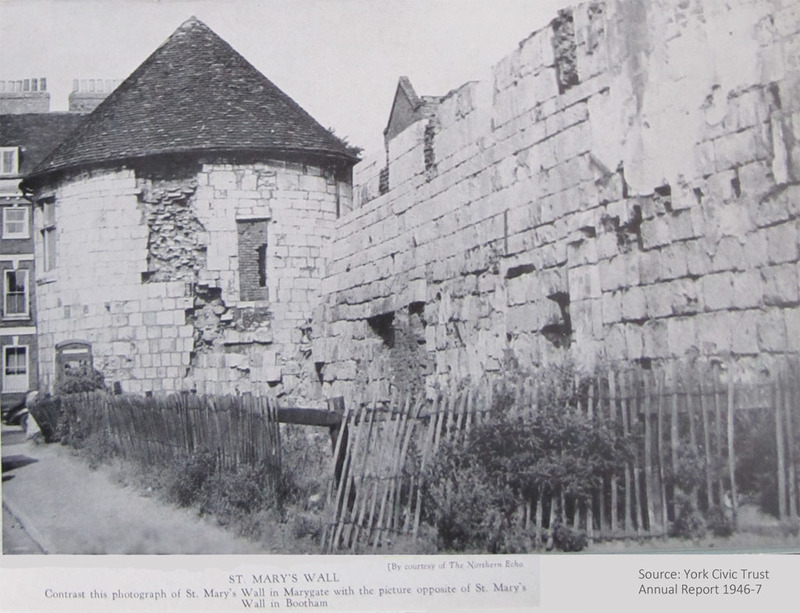 We might assume that all this visible damage is the result of the assault on the tower and wall in the siege of 1644. But the more we look deeply into the multi-layered history of the city the more we realise that it’s risky to rush to judgement about what is ancient or authentic or historically accurate. There were houses built here later, against these walls. They were then demolished in their turn. So are the rough-looking parts all siege damage or are they from the building and demolition of the houses once built right up against these older structures? 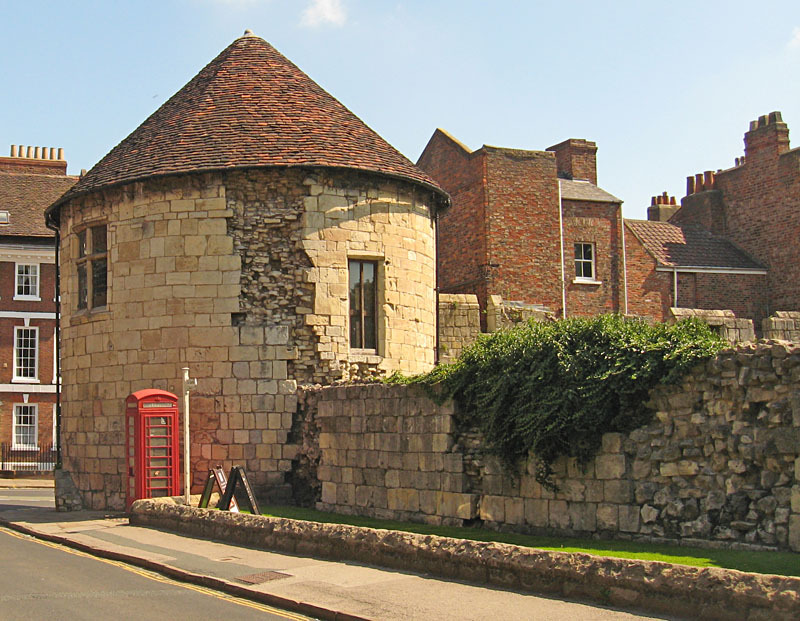 I can’t answer that question, but I can recommend a read of my ebook for a deeper exploration, a historical appreciation, of this location and many others, in a walk around 17th century York. 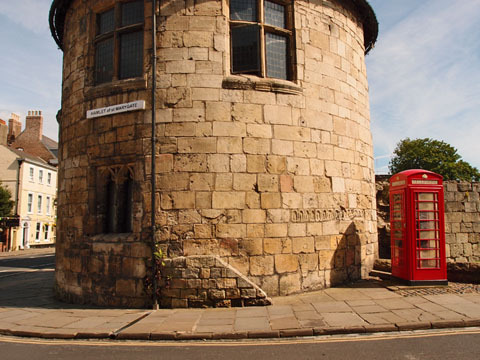 Next we head towards the city centre, and more observation of 21st century York. If you’re interested in 20th century history — a few years ago I compiled from dusty volumes of council minutes some notes on the history of a wartime hostel (aka ‘the hutments’) built during the Second World War on the land behind this wall (and since demolished): a history of the ‘hutments’. This page was sponsored by a reader. Thank you. To clarify the article, St Mary’s Abbey was constructed under Count Alan Rufus for his old friend Stephen of Whitby, and officially inaugurated by King William II in January or February of 1088, in the presence of senior members of the royal court. Count Alan designed the occasion as an act of repentance for Norman destruction in the North. Apparently this didn’t go down well with the most egregious perpetrators, because at Easter they rebelled en masse, beginning a civil war lasting several months. A defensive blockade of the ports and the comprehensive defeat by the English navy of an advance force from Normandy prevented invasion. Over the next two years, William II and Count Alan retaliated by undermining Normandy’s government in a variety of clever ways. By the time they landed a large English army in February 1091, the people of the Duchy welcomed them with open arms. King Philip I of France, alarmed at the ease with which Normandy was falling into English control, called in the French Pope, Odo of Chatillon (Urban II of First Crusade notoriety), to negotiate a compromise. Counties granted to William II were extensive and prosperous, and included Aumale, where Alan had his farming and forestry property of Richemont, which the castle in North Yorkshire may be named after. A few years after Alan’s death in 1093, William II attempted a second invasion of Normandy, but failed. The strategies employed by Henry I in the lead up to Tinchebray in 1106 resemble those of William II and Count Alan. Henry had cultivated good relations with Duke Alan IV “Fergant” of Brittany, who led an army in his support. Henry is said to have been born in Selby, South Yorkshire in 1068. Alan Rufus may have provided some comfort to Queen Matilda around this time, for within a few months she was urging King William I to grant Alan the lands of the rebel Earl Edwin. Orwen boldly asked Alan for a reward now that he had significant wealth in England; he granted her the Manor of Sibton in Suffolk. I speculate that Orwen or one of her servants may have been a trained midwife and assisted with Henry’s birth.